Just watched "Yonge Street," the Bravo documentary on the Toronto music scene in the 60's <http://watch.bravo.ca/yonge-street/yonge-street-toronto-rock--roll-stories/yonge-street---toronto-rock--roll-stories-part-1/ > and right now we're in the middle of 40th Anniversary celebrations of JUNO Awards. I was in Ontario between '67 and '70 and visited many of those venerable music venues - even played at a couple of them. Heard lots of great music but my most vivid recollection was those go-go girls shaking their bootie while Ronnie Hawkins played. Some of the folks being interviewed in that doc looked familiar including guitar player Stan Endersby who has dropped by the Blues Campfire a couple of times and George Semkiw is someone I met at a Recording Workshop at the Eastman School of Music in the summer of '69 (the rest of the Canadian contingent was Andre Perry, Jack Richardson and my buddy Doug Elphick who was an assistant engineer at Hallmark Studios who used to sneak us in to do some moonlighting at night. I had no idea that Stan and George had played with some of those pioneering Toronto bands. My new friend Johnny Brower also figured prominently, talking about how he convinced John and Yoko to come and play at his Rock & Roll Revival in 69. Wow, I just got "retweeted" - that's a first. Mind you I'm pretty new to Twitter and it's not much fun unless you have a smartphone. I just got a text that Jim Byrnes just won the Blues Juno. Despite my long-standing loyalty for Harry Manx, I have huge admiration for Jim. Looking forward to meeting him later tonight when I will be M.C. at the Blues JUNO fest celebrations at the Monarchs Pub at the Delta Chelsea, a room that is fast becoming THE blues venue in town. And I'm happy to say while I was there last night that Mike Smith booked me for Aug 18. Looking forward to it! Tomorrow night I get to watch the JUNOs from the hall, not on a TV screen in some cramped backtage media lounge. Ooops, it's earth hour. Now shutting down. Last Thursday (St Patrick's Day) I did a guest spot at Clinton's Tavern performing, you guessed it, "The Ghost of Clinton's Tavern," and in the course of the tune I even tried to invoke the ghost himself, who all the staff claim is quite real with manifestations such as ashtrays flying across the bar and feet appearing (and disappearing) under the mixing console. I was trying to be tuned in to any psychic energy but alas I felt nothing all night except a rocking groove provided by my impromptu back-up band, Lady and Gentlemen, a very promising young band who I'm sure you'll be hearing more of. The next night I was at Hugh's Room for the launch of Digging Roots' new CD. They were also a very promising young band when Lily Sazz and I encountered them on the stairwell of the Holiday Inn in Barrie, Ontario during the Ontario Council of Folk Festivals Conference a long time ago. They were a couple of first-nations musicians who had heard there was some music event going on in the hotel and I don't think they even knew what a music conference was but we invited them to come jam in the hotel room and were immediately captivated by Raven's guitar prowess and Shoshona's intense vocals. Well since then, they've showcased at many a music conference resulting in festival appearances across the country. Now here they were playing Hugh's Room, Toronto's premiere roots music venue, and I'm sitting at a table quite close to the stage when I feel somebody right behind me. I take a quick look over my left shoulder and have fleeting image of an elderly native woman looking straight ahead and more than the visual or the energy I pick up on an overwhelming feeling of approval and satisfaction. I was a little stunned and related this to my friend Jacquie between songs but was soon drawn back into the music until halfway through the set when, once again, I felt my "personal space" being occupied but this time I saw nothing. I'm pretty sensitive to energy, I think that's what makes me a good reiki channel, but this was the first time I ever had a "visual". Some might write it off to my overactive imagination, but I found out later from Shoshona and other family members that it was the birthday of Raven's grandmother who had passed away and I guess they had all been thinking of her and the kicker was that she was a leader and a person of authority in her community and that was the overwhelming vibe that I was feeling at that moment - that this was a person of great authority standing there giving her approval. I think this stuff happens to me because I'm able to just sit back and be "the observer" in these sort of situations and I don't try to analyze or explain anything, and I certainly have no desire to make any "contact." Nowadays I'm not shy about relating it to others, and in this case I was glad to be a sort of a messenger to these young artists who are quite adventurous and not bound by tradition that what they're doing is OK with at least one "ancestor". Upcoming gigs, Quebec tour, Memphis, Mississippi and more music back in T.O. The Ghost of Clinton's Tavern comes home: On St. Patrick's Day (Thurs) I'll be making a guests apperance with a young band comprised of a brother and sister who I've know for many years (and they're not that old). They've got a band called Lady and Gentlemen and since they're playing at Clinton's Tavern they had the idea that I should come over and play my tune "The Ghost of Clinton's Tavern" (or maybe it was their father's idea). I think I'm on at 10:15 and we're going to find out once and for all if that ghost is still hanging around. Clinton's is at Bloor West and Clinton. The last gig in Quebec will be quite special – historic, I would say. I'm doing a double bill with my oldest musical buddy, Allan Fraser, at the legendary Yellow Door coffee House, 3625 Aylmer St. in Montreal. Allan reminds me that we played together on that stage 40 years ago…it's all a blur to me. Congratulations to Allan who just had his tune "Dance Hall Girls" recorded by John Oates on his forthcoming album "Misissippi Mile" to be released in America on April 12th. Allan, of course, was half of the iconoclastic acid-folk duo Fraser & DeBolt back in the late 60s/early 70s and John Oates was half of the original "blue-eyed soul" group, Hall & Oates, the best-selling duo of all time, with 10 number one records and over 20 top 40 hits. Let's hope this one is another million seller! The Quebec Tour Itinerary – Je Reviens! Visit www.canadianblues.ca and the first thing you'll see is my mug. I believe I'm the cover boy! Well, you can be sure you'll never see my mug on the cover of MapleBlues – not while I'm the editor, anyway. Accusations of nepotism, cronyism and conflict of interest will ensure that. We even had a great profile already written by the wonderful Ruth Schweitzer but that will have to run somewhere else. And you're not going to see this old blues guy in a showcase or a competition (more likely I would be called to be a judge!). My regular drummer at the Campfire is a CBC producer but do you think he could get us on the radio? No way, that would be a conflict of interest! I give up. OK, end of monthly whine. New Folk Blues now available on iTunes as well as other online distribution. 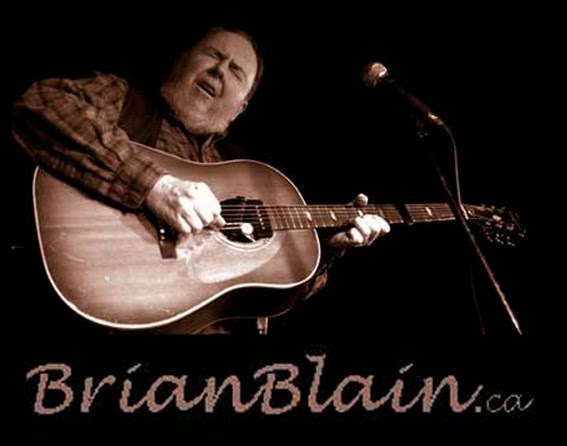 Or if you want a real CD, just go to brianblain.ca and click "buy"
Down in Mississippi: Driving from Memphis it seemed like every exit had a place name that resonated from some blues lyric I had sung or heard. Jackson is the capital of Mississippi but has been criminally ignored by the state officials (some thought there was a plot amongst the power elite to move the capital – so believes my host Sherman Lee who ran for Governor and may again). A few years back they did throw in a little money to make a tourist destination out of Farish Street, so they could have something like Beale St. in Memphis or Bourbon St. in New Orleans. Sherman Lee's son opened an after-hours juke joint on the street and called it Frank Jones' Corner after a slave who had lived there. They are allowed to serve liquor until 4am, because of the special tourist designation, so you can imagine the joint was jumping on a Saturday night when it was the only place in Jackson where you could get a drink after 1am. Security was tight, as you can see from this picture – yes, that's me sitting in on the Flying-V with the super-slinky strings. There was an MC and a special guest, "The Rock". a one-armed, septuagenarian who sang (and danced) "The Twist." On the cash register was a small "Thank You For Not…" smoking sign but everybody was smoking - even the barmaid. And they like their cigarillos in Jackson. In fact, they make their reefers out of cigarello shells. The entrance to the men's room was directly opposite the main entrance and the stall door was directly in front of the washroom door, which was kept ajar. Now this in itself is no big deal except there was no latch on the stall door (and it was not within reach when you were sitting). So a lot was left to good faith, especially considering that free food seems to have triggered some rushed trips to the stall. Along the opposite wall was a long ceramic urinal, then at the back was a really big ceramic urinal…wait a minute, it's a bathtub converted into a urinal (at least I think so). The reason I got to Mississippi was that I was already in Memphis attending the Folk Alliance music conference. I was supposed to be there wearing my media-person hat but I did bring my guitar and got to play a little. This conference runs like clockwork (as opposed to music week where you could not really count on showcases starting at the announced time). At Folk Alliance the production was first class – they understand the concept that if you're going to have acoustic instruments, you need a sound system with a lot of headroom…and a sound person with a senses of restraint. For the most part it worked out fine. I was in sacred steel heaven for about three hours as I listened to the greatest proponents of that precious art form. There was a procession of great players including pioneer Ted Beard (who seemed a little lost in a showcase scene – he was barely warmed up when it was time to stop), established stars like the Campbell Brothers, some up and comers and even a couple of token white guys. The group I would traveled all that way to see, even if there was no one else, was The Steeldrivers and they did not disappoint. I was right up front and I leaned over to guitarist Mike Hendeson (who has some serious blues cred) and asked did anyone ever call what they're doing 'bluesgrass' - he just smiled. I also got to hear a bit of another slide legend, Pura Fe, and I sure would like to hear more. I think she might have a Canadian connection. Canucks fared very well at Folk Alliance – John Showman's New Coubtry Rehab was the buzz act. Ron Sexsmith played to a crowd that didn't seem to know that he was a pretty big deal in Canada. In the private room showcases it was all-business. Not a lot of spontaneous jamming like I remember from my last time in Memphis. I saw one very well-known award-winning Canadian artist in a room showcase and I was the entire audience for a couple of tunes. If you hadn't lready arranged for people to come and see you, then chances are no one would come. I had my "15 minutes" (literally) and it was interesting to note that except for the people who were already there, the only audience who came to see me were the last people I invited (hmmm, they may have been the only people I invited). I invited the fellow that was going on after me to play along if he felt inclined (I'm always in campfire mode) and it turned out he was Jackson Browne's guitarist for the last 15 years. His name was Mark Goldenberg. I heard an amazing fiddle player with an unpronounceable name who I have yet to track down. Out and About in Toronto: I came away from the Folk Alliance conference thinking the road to success (or at least, to getting noticed) is to be strumming that guitar as hard as you can and singing at the top of your range…and when I got home that was further reinforced when I went to see Paul James at the Gladstone and had a fabulous (watching and learning as I told him) but he broke a total of seven strings (2 in one song). Still it was great show and you just know that it would be the same show whether there was ten people or ten thousand. He said it was Bo Diddley who told him you had to do more than just sing and play – you had to entertain! On Saturday afternoon we went to The Rex where the inimitable Danny Marks threatened to break a string but never did despite playing continuous for three hours. And in those three hours, not a single blues tune…. Then there was an exquisite show from Harry Manx in Hamilton. No need to slam the guitar or raise his voice here. He just keeps getting better. That's what it takes to keep the momentum (once you've been noticed). Your music has to be outstanding and your performance has to be flawless. I remember a few years back when Harry's agent said to me "we don't start making money until you guys are getting ten-thousand a night." Well I told Harry this was "the ten-thousand dollar show" and what took it to the next level was the phenomenal organist who he brought back from Australia. His name is Clayton Doley and he plays like no organist I've ever heard (and I've heard them all – close up). He wasn't playing a B3 (though he indicated that was his preference) but he had one of those Nord keyboards and he was coaxing sounds out of it that made me ask if he had custome patches in there but no, it was just a stock unit. It's all in the way he played it and I bet if it was a B3 he would have been getting the same effect. He says he'd like to move to Toronto and I hope he does! Day One of Canadian Music Week and I decide to leave my car at home and take the TTC. Usually when I try this I have interminable waits but this time it was quite fast. but as if hanging at CMW for a day didn't make me feel old enough, a woman offered me a seat on the streetcar back. The good news is I just realized I can ride the TTC at the senior rate – two bucks instead of three. Nobody's asked me for ID yet. Long time Blainletter readers will remember how I used to rate CD launches and press conferences by the quality of the munchies (I had a rating system of one to four shrimp). I had been looking forward to the Nova Scotia Music reception at CMW because I remembered fabulous fish chowder and oysters on the half-shell and other maritime treats, but when I got there this year they wouldn't let me in because I had not RSVP'd. Never mind. But as I was leaving I got invited to join a group for dinner, a group that included maritime star Kim Stockwood and her manager Sheri Jones along with an up-and-comer called Molly Thomason and later another important manager. By the time I finished dinner they had arranged my entry into the inner sanctum and I could see the big cauldron of chowder but I was so full of Pad Thai that there was no way! So that's close but "no shrimp" for Music Nova Scotia. The Australian contingent had a BBQ at the (Legendary) Horseshoe Tavern but when I asked for mustard they said "No mustard, we were told to keep it traditional." So I'll have to deduct one shrimp for that. At the French Embassy's cocktail reception, I got to the buffet a little late and there was exactly one shrimp left on the platter. So they get a "one shrimp" rating for that (and yes, I ate the last shrimp!). It's not like the old days where people walked around with trays of exotic munchies and they would have to explain what it was you were about to put in your mouth. Actually, the Luminato launch had some waiter walking around with little bite-sized bacon-and-egg breakfast sandwiches – that was pretty good, especially if you're going to do your launch at 10:30 in the morning. They had the group Delhi to Dublin (or vice versa) playing a few tunes and that was great. It was all happening in the lobby of Roy Thomson Hall. Reminded me a bit of the old (golden) days cigarette sponsorship. They knew how to spend money. French radio guy says a song that mixed French and English lyrics would never be accepted in France. Au contraire au Quebec! Social media Tip of the Day: Take a pic of your audience, post it on your facebook and ask the fans to tag themselves. The Indie Musician's Toast: May your fan become your patron and may your patron become your promoter. After seeing a couple of very generic bands in high-profile clubs I did hear some amazingly original music (Barr Brothers from Montreal on the roots side and Brandt Brauer Frick from Berlin on the electronica side). Tiken Jah Fakoly from Cape Verdi played at Revival as a "surprise guest" and after an interminable sound check they stepped to the back room for moment, then hit the stage – as a waft of that sweet smell wafted halfway into the room. They provided the ultimate afro-reggae experience. What a drummer! On the Friday night I stayed home and did some jamming with one of my son's DJ buddies and we had a blast. I intend to explore this blues-tinged electronica further. It appeals to my lazy nature. I don't have to sing or remember words. I don't have to speak between songs, because there are no songs. We just start making music and don't stop until it's over.